Bangalore is not only one of India’s most progressive cities but is also a city with a rich history. A Bangalore city tour can not only be fun but also enriching. Bangalore was a part of many south Indian kingdoms and its history dates back to the Iron ages. The city is not small and has a lot to see and experience. Thus, if you have only one day in this city, it becomes important to prioritize what you want to see. Here are some of the iconic structures in Bangalore that you should not miss out on. Even if you are not a religious person this place must be on your Bangalore city tour itinerary. This rock cut temple dedicated to Lord Shiva was built in the 16th century by Kempe Gowda I, the founder of Bangalore. The temple is one of the oldest in Bangalore and proof of how advanced Indian architecture was in the 16th century. The main attractions of the temple compound are 4 granite pillars in the courtyard. Two of these pillars support giant discs depicting the sun and the moon while the other two support statues of the Nandi Bull. There are a number of other monolithic sculptures in the compound as well. On Makar Sankranti, the evening sunlight passes between the horns of the Nandi bulls and falls on the linga within the cave. This garden is unlike any other garden in India. It has been recognized nationally and internationally for its efforts towards the scientific study of plants, plant conservation, and botanical artwork. The garden is spread over 240 acres of land and houses more than 1800 plant species. The garden was initially conceived by Hyder Ali in 1760 and was later completed by his son, Tipu Sultan. Apart from the flowers and the arrangements, the garden is also famous for the Lalbagh rock, lake, and aquarium. The glass house in the garden is designed along the lines of the Crystal Palace in England. There are enough flowers and plants in this garden for nature lovers and photography enthusiasts to spend the whole day here. 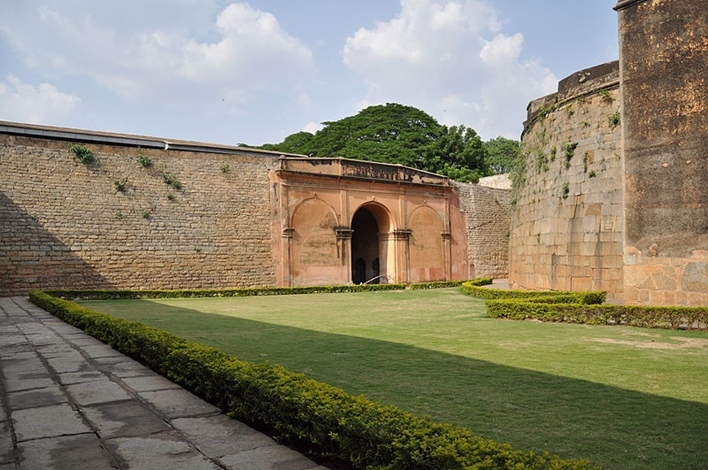 The Bangalore Fort dates back to 1537 when it was a mud fort built by Kempe Gowda I. It was rebuilt as a stone fort in 1761 by Haider Ali. The Bangalore fort was designed with a mile long perimeter of stone masonry with a deep ditch behind it. This was commanded from 26 towers set along the ramparts. The demolition of the fort began in 1791 and continued till the late 1930s after it was captured by the British. Today, all that remains of the fort is the Delhi Gate and two bastions. Tipu Sultan’s Summer Palace was originally contained within the Bangalore Fort. Well, no Bangalore city tour is complete without visiting the fort. The Bangalore Palace was originally the home of Rev. Garrett. It was bought by Maharaja Chamarajendra Wadiyar X in 1873. The palace is built in the Tudor style of architecture with fortified battlements and towers. Its interiors boast of a number of pillars and arches, carved floral motifs in wood, patterned walls and relief paintings on the ceilings. The palace houses a number of trophies, crystal chandeliers, paintings by Raja Ravi Verma and the Wadiyar Coat of Arms. Many rooms also boast of stained glass windows imported from England. 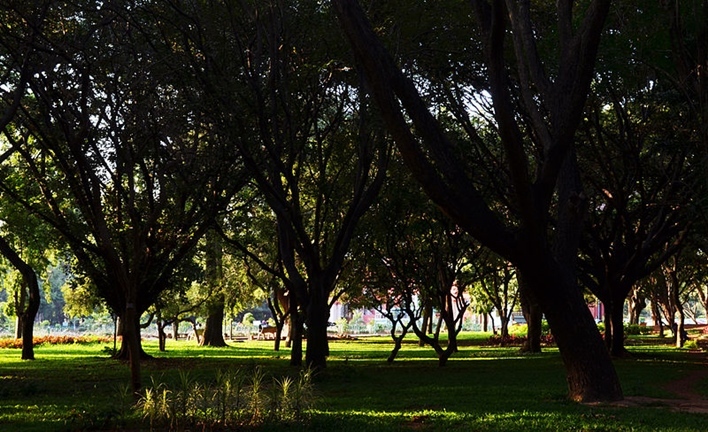 This iconic park must find a place in your Bangalore city tour list. Bangalore is called the City of Parks and Cubbon Park is probably one of Bangalore’s most well-known parks. Officially, it is known as Sri. Chamarajendra Park. The park is spread over 100 acres and has motor-able roads as well as walking paths that meander through its lush, green expanse. The park is home to over 6000 trees including indigenous species and silver oak trees imported from Australia. A few public buildings are also located inside and along the park’s periphery. Part of the park between the Museum and the High Court central hall has been designed as a formal garden. The terrace gardens in the East and the bandstand are another part of the park worth visiting. Other parts of the park you must see are the rosary, Ringwood circle, bamboo grove, and lotus pond. The history of St. Mary’s Basilica dates back to the 17th century. 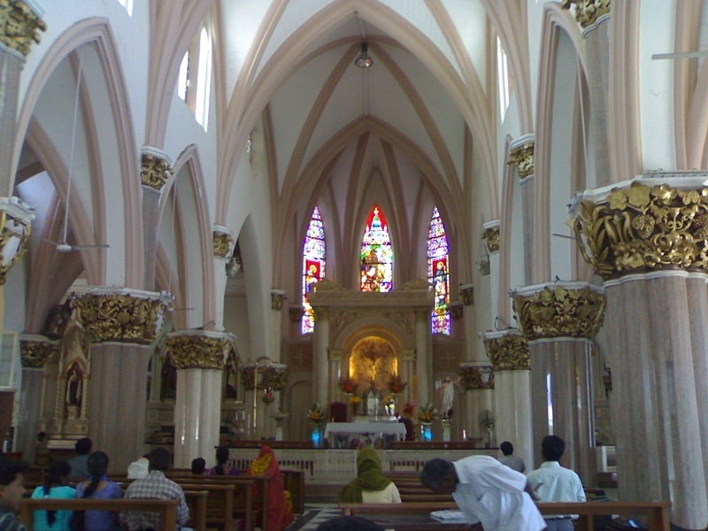 It is one of the oldest churches in Karnataka and the only church in Karnataka that was made a minor basilica. When the church was first built, it took the form of a thatched hut. This was expanded and later pulled down. The existing structure was built in 1875. The architecture of the church follows a gothic style with multiple columns and spires that can be seen from a distance. The ornamental motifs, arches, and stained glass windows are also noteworthy. Unlike most other churches, the statue of Mother Mary inside the church is draped in a saree. If you are history buff, add this to your Bangalore city tour list. As the sun sets, head to the Indira Gandhi Musical Fountain Park. A 25-minute fountain show begins at 7 pm. The show combines fountain patterns with music, lights, color and visual projections. This musical, dancing fountain was commissioned in 1996 as part of the plan to beautify Bangalore. The fountain is part of a 17-acre garden and is programmed to play according to various Hindi, Kannada and western themes.